As the northern Philippine town of Kabayan promotes a summer trek to the mountains, officials appeal for tourist respect for the Ibaloi mummies that inhabit the many caves along the way. This town is again promoting a summer trek to Mt. Pulag, with mummies as the main attraction. But local officials have a piece of advice for visitors: Respect the mummies. Mayor Faustino Aquisan said some mummies and human skeletons in the ancient burial caves had been desecrated because visitors, in their desire to get souvenirs, would sometimes touch or get bones from the burial sites. â€œMany mummies have been stolen from caves. The mummies should not be touched. Stealing them or getting their bones could bring bad luck,â€ he said. The town has prepared tour packages for its Bendiyan Festival from April 30 to May 2, in an effort to become a globally competitive ecotourism destination. This tradition is absolutely amazing! My boss in the National Museum of the Philippines was studying these mummies (both he and Jun, my supervisor, were the protagonists of a documentary by National Geographic). He told me that the people of the mummies were considered “lucky charms” and they celebrate parties with the coffins of the mummies. I loved that! The IBaloi kept mummifying their dead up until the 19th century. Some mummies were taken by foreigners and now the Philippine government is doing a lot of efforts to get all of them back since they are a crucial part of Ibaloi culture. Before I left the Philippines, the museum was trying to find out if one mummy in Granada was Ibaloi…But I don’t know what happened. Sorry, this should read: He told me that for the Ibaloi, the mummies were considered â€œlucky charmsâ€ and they celebrate parties with the coffins of the mummies. 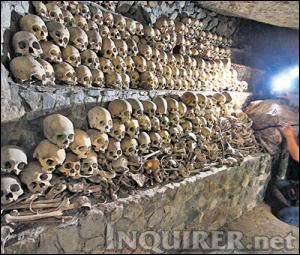 Town folks of kabayan, benguet are complaining concerning the desecration of the kabayan mummies by the tourists. I would suggest the local authorities to assigned trusted guardians of the place particularly to the cave entrance and exist in a way that no tourists could touch the sacred remains of the ibaloi ancestors. Because if these remains are sacred, then respect and reverence should be observed.